Many industries today operate on a 24/7 schedule. This calls for extremely energy-efficient, durable, low-maintenance and robust lighting components which help to reduce lighting costs to a minimum. Moreover, high ceilings and special production conditions in the various industries can necessitate a high quality of light with maximum light output and optimal CRI values, so that employees, as well as the machinery, can work flexibly and efficiently. In many cases, the light must also show a low output ripple current, i.e. it has to be “flicker-free,” so that the functionality of modern machines or scanner systems remains unaffected. OSRAM: A lot has changed in the industrial lighting sector. What are the current trends? Peter Bach: Most notably, the energy efficiency of LED technology has by now significantly surpassed that of conventional T5 fluorescent tubes. So now it makes sense to think about using LEDs in the industrial sector as well – not only for new installations, but also within modernization projects. Another very important factor is the extreme durability of LED lighting, considering that luminaire maintenance at heights of 8 to 16 meters is very costly, especially if machines have to be stopped in order to carry out the maintenance work. Our goal, therefore, is to avoid maintenance work, preferably alltogether, by launching a system of very durable lighting components with very long guarantee periods. OSRAM: Does this mean that customers have become more demanding? Peter Bach: Industrial customers are primarily concerned with economic issues. In many areas, LED technology is superior to traditional industrial lighting, especially in terms of total cost of ownership. Moreover, LED luminaires for the industrial sector have meanwhile become less expensive to purchase. This is why more and more industrial customers are now completely switching over to LED technology – and to a corresponding light management system. 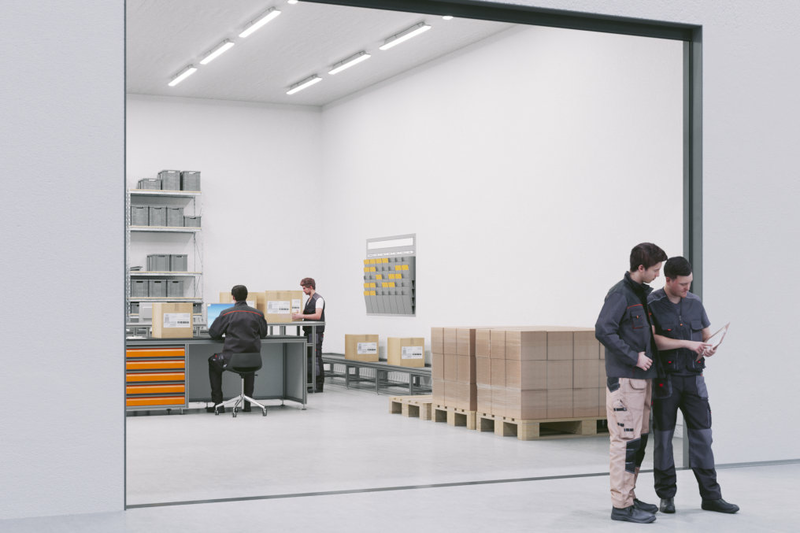 OSRAM: So light management systems are required even in rather simple industrial buildings? Nicolai Heber: In warehouses with high-bay racking, lighting costs can amount to up to 80 percent of the entire energy cost. So it does make sense here to use an intelligent light management system – especially if you consider that the investment for the corresponding technology quickly pays off because you can save a lot of money by applying motion and presence detection systems and special features such as the constant lumen output (CLO) function. But using intelligent control systems also pays off in production facilities, where you can flexibly group and address individual luminaires, luminaire clusters or entire areas via light management or building management systems. Apart from the potential energy savings, this also represents an added value for the end customer. It may even be that several sites are interconnected and maintained via remote access – which, for example, is where our ENCELIUM system comes into play. OSRAM: Which product innovations would you point out especially here? Nicolai Heber: In the industrial sector, the lighting often needs to fulfill special requirements, for instance when high ambient temperatures or, as is the case in refrigerated warehouses, very low ambient temperatures are involved. That is why, this year, we will launch new LED drivers and LED modules which can withstand significantly higher and lower temperatures and which also offer a higher switching capability and robustness, and a longer lifetime. This, in turn, enables us to offer longer guarantee periods. All of this, of course, in combination with corresponding sensor technology, such as our high-bay sensors, which allow daylight and motion detection even in very high buildings, or with HF sensors, which can be integrated into damp-proof luminaires. OSRAM: What other options are there in terms of saving energy? Nicolai Heber: The CLO feature, for example, is very important for intelligent energy management. This is a constant lumen output control function, which we are integrating as a standard feature into our DALI drivers as well as into our switchable industrial drivers. It allows compensating for lumen depreciation over time via the driver and thus saves the light that was formerly overplanned. This means that there is no need for unnecessarily high energy consumption at the beginning of the life cycle, with possible savings of up to 20 percent. OSRAM will soon be the first lighting manufacturer to offer this function as a free feature also for switchable LED drivers, which means that our customers can plan their lighting projects more efficiently. 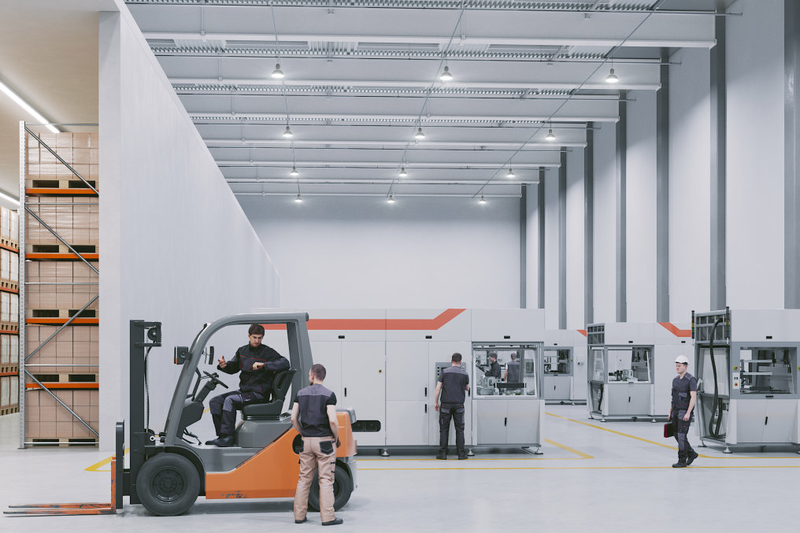 OSRAM: Lighting in modern industrial facilities must not only be energy-efficient, but also high-quality. Nicolai Heber: Exactly. This is true, for instance, for the logistics industry, where scanner systems are applied. In this area, the lighting must not only be bright, but its quality must also be high, so that these systems, most of which are very sensitive, can work properly. Our LED drivers ensure a low output ripple current of under 1 %. This means that negative effects on scanner systems and other machines can be prevented – at any dimming level. OSRAM: Are industrial customers today more sensitive to comfort factors, such as color temperature? Nicolai Heber: Quality of light, in fact, is also very important in the industrial sector – in the automotive industry, for example, where people are manufacturing precision parts. It is absolutely essential here to not only have a bright, but high-quality lighting that enables you to concentrate and to work without making mistakes. This is why Human Centric Lighting is also playing an increasingly important role in the industrial sector. OSRAM: How do you see the future of industrial lighting? Nicolai Heber: I believe that, when industrial facilities need to be modernized, we will see more and more customers using dimmable instead of switchable lighting solutions. Moreover, they can now also use a ZigBee gateway to apply a wireless solution, which means that no new wiring has to be installed. On the whole, thanks to LED technology, everything is becoming more intelligent. Therefore, we will also see an increased use of LED driver data, such as energy consumption, dimming level, or remaining lifetime. These data can be applied, for example, for energy efficiency optimization, or for predictive planning and more cost-efficient execution of maintenance work. 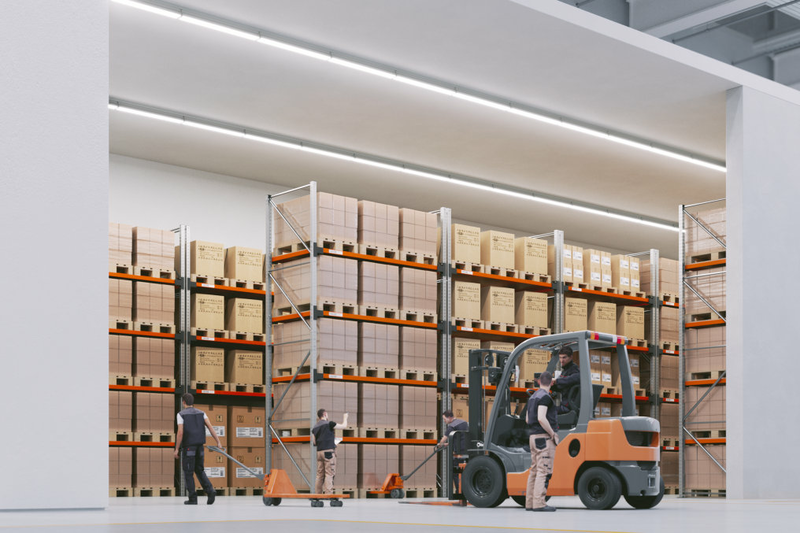 The requirements for industrial lighting projects are high: Even in large industrial buildings, the light output and the quality of light must enable employees to go about their work without getting tired. The profitability factor is crucial as well: In order to reduce the total cost of lighting to a minimum, it has to be as energy-efficient, durable and robust as possible. On top of that, there is a whole range of special requirements which, depending on the industry that they belong to, can vary widely. This, for example, includes a high temperature resistance or a low output ripple current, which is especially important for the proper functioning of scanner systems also used in conventional production. In the smaller production and storage hall, modern damp-proof luminaires replace conventional luminaires equipped with T5 fluorescent tubes. Inside these luminaires, our innovative PrevaLED Basic Linear LED modules and our HF LS LI sensors – in combination with high-quality OPTOTRONIC Intelligent DALI 100 IND LED drivers – provide extremely energy-efficient lighting. With this solution, the light is only switched on when work is being done in the detection area and/or only if the daylight from outside is not sufficient any more for focussed work. An alternative possibility for saving energy is provided by using a switchable solution with OPTOTRONIC FIT 100 IND drivers, which are already available with the integrated CLO feature and therefore also save energy. In warehouses with high-bay racking, the corridors between the storage racks have to be optimally illuminated. This can be done by using an LED trunking system equipped with PrevaLED Linear G4 LED modules from OSRAM. In this area, our OPTOTRONIC Intelligent DALI 100 or 150 W IND LED drivers are used because a higher light output is needed and because, in combination with the LED modules, these drivers can generate a luminous flux of up to 16,000 lm. In high-bay racking, however, operations are not continuous throughout the entire day. This is why using modern sensor technology makes perfect sense here in order to maximize the energy efficiency of the LED installation. It's a special challenge for lighting planners: A large industrial building with multipurpose use, where extreme ceiling heights of up to 16 m demand the application of especially powerful high-bay luminaires. 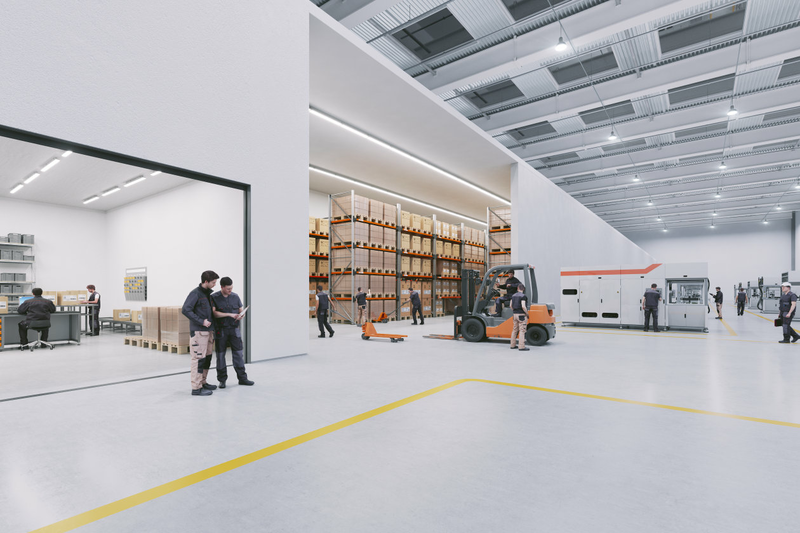 But that's not all: In addition, individual production and logistics components are often installed at alternating locations throughout the facility and then removed again some time later. The solution: A flexible LED system based on DALI PROFESSIONAL and HIGH BAY SENSOR as well as, for example, PrevaLED BRICK LED modules and OPTOTRONIC 1DIMA drivers from OSRAM, which optimally combines artificial lighting with daylight harvesting. Industrial facilities call for a type of lighting that should be as natural and as glare-free as possible. With the right light management system as well as with integrated daylight and motion detection sensors, the addition of artificial light can be controlled intelligently and energy-efficiently. Our light management systems enable various installation sizes. The application of lighting control also pays off in sections of production or storage facilities, such as corridors or workstations, with motion and daylight detection systems, such as the HIGH BAY SENSOR from OSRAM for motion detection in switchable installations – even with additional daylight detection and integration into DALI systems when combined with the DALI HIGHBAY ADAPTER. With the innovative light management systems from OSRAM, lighting control now is as easy, modern and versatile as never before. DALIeco BT control, for example, allows comfortable configuration and control of diverse lighting parameters via app. There are even more options to discover with DALI PROFESSIONAL and the DALI PRO Control app: This combination allows designing complex lighting scenarios and then controlling them individually via smartphone. And finally, if you're looking for highest levels of flexibility and performance, there is ENCELIUM: This system it perfectly suitable for light management within large and complex networks and supports its users effectively in reducing energy costs for lighting by up to 75 %.